Rank and Organization: Staff Sergeant, U.S. Army, Company D, 2d Battalion, 75th Ranger Regiment. Place and Date: Paktya Province, Afghanistan, 26 May 2008. Entered service at: New Mexico. Born: 29 July 1979, Santa Fe, New Mexico. 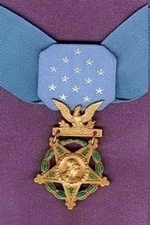 Citation: For conspicuous gallantry and intrepidity at the risk of his life above and beyond the call of duty, Staff Sergeant Leroy A. Petry distinguished himself by acts of gallantry and intrepidity at the risk of his life above and beyond the call of duty in action with an armed enemy in the vicinity of Paktya Province, Afghanistan, on May 26, 2008. As a Weapons Squad Leader with D Company, 2nd Battalion, 75th Ranger Regiment, Staff Sergeant Petry moved to clear the courtyard of a house that potentially contained high-value combatants. While crossing the courtyard, Staff Sergeant Petry and another Ranger were engaged and wounded by automatic weapons fire from enemy fighters. Still under enemy fire, and wounded in both legs, Staff Sergeant Petry led the other Ranger to cover. He then reported the situation and engaged the enemy with a hand grenade, providing suppression as another Ranger moved to his position. The enemy quickly responded by maneuvering closer and throwing grenades. The first grenade explosion knocked his two fellow Rangers to the ground and wounded both with shrapnel. A second grenade then landed only a few feet away from them. Instantly realizing the danger, Staff Sergeant Petry, unhesitatingly and with complete disregard for his safety, deliberately and selflessly moved forward, picked up the grenade, and in an effort to clear the immediate threat, threw the grenade away from his fellow Rangers. As he was releasing the grenade it detonated, amputating his right hand at the wrist and further injuring him with multiple shrapnel wounds. Although picking up and throwing the live grenade grievously wounded Staff Sergeant Petry, his gallant act undeniably saved his fellow Rangers from being severely wounded or killed. Despite the severity of his wounds, Staff Sergeant Petry continued to maintain the presence of mind to place a tourniquet on his right wrist before communicating the situation by radio in order to coordinate support for himself and his fellow wounded Rangers. Staff Sergeant Petry’s extraordinary heroism and devotion to duty are in keeping with the highest traditions of military service, and reflect great credit upon himself, 75th Ranger Regiment, and the United States Army.